So, I had an interview* recently where I was asked to prepare a storytime plan. I decided to have fun with it and not overthink things for a change, and just go with a theme that I've done a few times and always have fun with, "Shark Week". 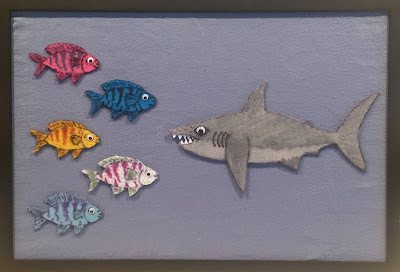 I do a Shark Week theme every year and already had some really fun books and a few good songs, so I decided to come up with a couple of additional activities using flannel & felt props as well. Five little fishies, swimming in the sea. Teasing Mr. Shark, "You can't catch me!" And SNAPPED that fishy right out of the sea! No little fishies, swimming in the sea. Just Mr. Shark, as full as can be! The first one said, "The pool is cool"
The second one said, "The pool is deep"
The third one said, "I want to sleep"
The fourth one said, "Let's dive and dip!" The fifth one said, "I spy a ship!" Along comes a boat, a line goes KERSPLASH! I'll share the second one in another post soon, so stay tuned! FYI, the Discovery Channel's "Shark Week" kicks off July 22. *I'm extremely happy to report I did get the job!! Next month I will move from Outreach to the Children's Department of our busiest branch. I super excited to be back in a children's department, and working with some awesome children's librarians there! For more felt & flannel ideas and tips, check out the Flannel Friday Facebook group and Pinterest Boards! To share your flannel, submit via the Flannel Friday Tumblr. For complete information and all the details, visit the main Flannel Friday website.